Spool it with the new Booyah Streak IV. 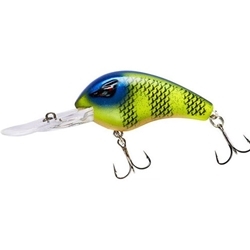 This 2oz crankbait combined with booyah's unique foam-injected body lets you reach further than the competition in both casting distance and depth. Reaching to 25 feet, the patented molded lip and rattle chamber design transmits a distinct sound that you can only get with the Streak. The 1/0 EWG hooks are securely anchored by the Streak's wire-through-body design.